Investigations and surveys by Transparency International Slovakia show that healthcare procurement is considered corrupt in Slovakia, but over the past years only a handful of cases have been formally investigated and no one has been brought to justice. That is why monitoring procurement in healthcare has become a priority for us and why we decided to delve into publicly available procurement data to find out what was going on. 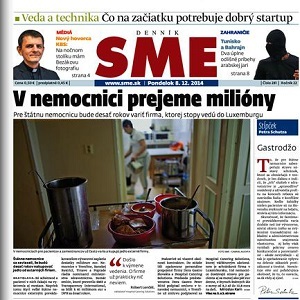 We worked with SME, a major Slovak newspaper, and decided to dig deeper. The story we published in December brought protesters to the streets of Bratislava, the capital, and three days after the story broke the Minister of Health asked his chief of staff as well as managers of three of the hospitals we had investigated to step down. (In the fourth hospital, the manager who had overseen the tender we investigated was no longer in office). The government also made commitments to tighten and monitor health care procurement. In short succession in 2013 and 2014 DORA Gastro Slovakia, a company with no previous procurement experience, won three huge 10-year tenders to operate catering in three major hospitals. A second firm, Hospital Catering Solutions (HCS), won a similar tender in another hospital. The four state-owned hospitals were to pay more than 80 million EUR (US$94.5 million). Such long-term tenders that included costs for refurbishing catering facilities were unheard of in Slovakia. Previously, hospitals took care of providing meals themselves in existing facilities or had them delivered from outside. DORA Gastro and HCS appeared to have put in independent competing bids but we found out that the two companies were connected. Documents showed that Peter Bittó was chairman of Dora Gastro and general manager of HCS. In a separate procurement tender, carried out by another Slovak municipality, the two companies had joined forces on a common bid. Companies that take turns winning in similar tenders raise textbook red flags for collusion, the illegal secret agreements made between parties to fix pricing in an effort to guarantee financial gain. Neither DORA Gastro nor HCS had previous experience with large tenders and both only won the tenders working with established companies that had previously succeeded in public procurement. More worrying were the high costs of the winning bids: the four hospitals could have saved more than 21 million EUR (US$25 million) over 10 years had they bought catering services elsewhere. So who was really behind these bids and these companies? The majority stake in HCS is held by Kanebo Investments, an anonymous company based in Luxembourg in a building that houses dozens of other companies. The beneficial owner of Kanebo Investments remains unknown. It is not clear who really owns DORA Gastro either. All we know is that it is a joint stock company. This lack of transparency was another red flag. When the story broke of the alleged collusion between DORA Gastro and HCS and the alleged links to government officials, all major media in Slovakia reported on the scandal. An opposition political party highlighted the fact that the three hospitals had broken the law when they failed to obtain the cabinet’s approval for the large tenders. The tenders had merely been approved by the Ministry of Health’s chief of staff Martin Senčák. Before joining the ministry, Senčák had worked for a global catering company that collaborated with HCS on one of the hospital tenders in Slovakia. The Ministry of Health has since announced tighter oversight of public procurement in healthcare in line with recommendations that Transparency International Slovakia has made over a period of time. In the future, procurement cost comparisons will be carried out and published; price caps for services or medical equipment will be introduced and greater transparency of hospital management will be enforced. This seems promising. Two years ago, we found that prices hospitals pay for CT scanners can differ by up to 100 percent. Comparing prices hospitals pay in different countries could go a long way to increasing spending efficiency and curbing corruption in healthcare. We will continue to keep pressure on the government to put in place the promised measures and monitor further tenders. Aggregate procurement data have proven a useful source for identifying red flags. However, we are still waiting for the illegal hospital catering tenders to be formally cancelled. ← Greeting 2015: Is there any hope for those fighting corruption in Turkey?